In the marshlands of the southeast United States, the periwinkle snail is among the most abundant grazing species. "You can look out at high tide and see them everywhere, climbing up on the grasses," said Randall Hughes, assistant professor of marine and environmental sciences at Northeastern's Marine Science Center in Nahant, Mass. According to Hughes, the periwinkles climb the marsh grasses for two reasons: food and safety. In terms of safety, the grasses' height above the water gives the snails a place to escape their underwater predators. For food, the snails nibble the grass itself as well as the fungi that grow in these grazing scars. Periwinkles have been munching on marsh grasses for eons, Hughes explained, but recent droughts and high temperatures, combined with lower numbers of snail predators, have increased the snails' effect on the grasses' survival: "Occasionally," she said, "you'll see a whole area that's completely denuded." 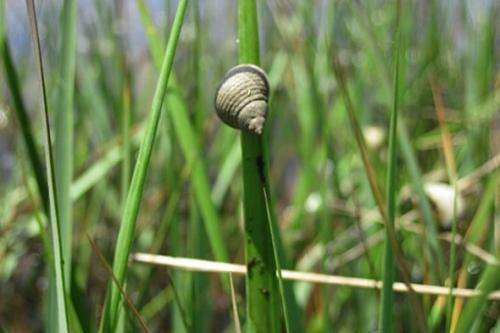 For this reason, researchers like Hughes have begun focusing on snails' impact on marsh grasses. They've had a particular interest in studying the vegetative form of the plants, which researchers have long believed to be more common than the sexually reproductive form. While the latter stems spread their genetic information with flower seeds, vegetative stems do it by sending out underground rhizomes, or roots, which sprout new, genetically identical ones. In a paper recently published in the journal Marine Ecology Progress Series, Hughes and Robyn Zerebecki, a former graduate student in the Three Seas program, found an interesting preference among the periwinkles: they seem to like hanging out on sexually reproductive grass stems more than vegetative stems. Because it is generally assumed that the dominant form of reproduction is vegetative, perhaps it doesn't matter too much that the periwinkles prefer sexually reproductive stems. But Hughes doesn't agree with that assumption. 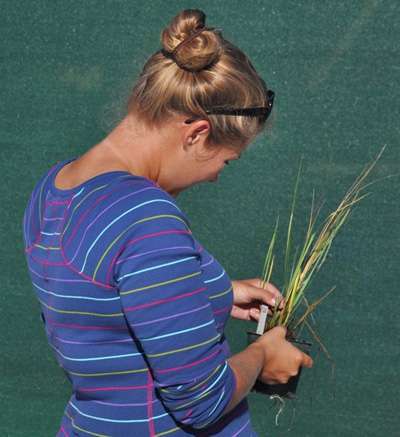 "We've found there's more genetic diversity in the marsh grasses than expected be if most reproduction is clonal," Hughes explained. That means the sexually reproducing stems actually play a rather important role in the community. Hughes and Zerebecki decided to examine the snails' impact on these stems. As it turns out, the answer is 'minimal.' While previous research has shown snails can destroy vegetative stems, the sexually reproductive ones seem to be tougher and less susceptible to the snails' grazing. Hughes noted that there's virtually no nutritional reason behind the snails' preference. So what is it about the flowering stems that makes them so desirable? "They'll climb the tallest, most rigid grasses available," she explained, adding that the vegetative stems tend to be shorter and more flexible than the flowering stems. Regardless of why they climb the reproductive grasses more, Hughes' results point to a needed shift in the research community: "The attention paid to the negative effects of snails is all focused on one stage in the lifecycle," she said. "But we can't assume the same thing happens across all stages." The results, in the midst of a growing wave of gloomy climate-related research, provide a modicum of reassurance, said Hughes. "Even when we see obvious grazing on vegetative stems, this research suggests that sexual reproduction may provide some resiliency for the marsh system to the negative effects of snail grazing."